This is my third post about the Johnnie Walker Art of Blending webcast event with Johnnie Walker Master Blender Andrew Ford. Why am I still blogging about it? I realize I’m probably providing more coverage than a lot of people are interested in, but I thought I’d try to give a full account of the webcast, as different bits of information might be of interest to different people. This post will cover the final two-thirds of the webcast, where Mr. Ford walked through the 7 samples that were provided in the blending kit. I’ll share Mr. Ford’s insights, as well as his answers to questions that were posed along the way. Finally, I’ll provide some of my own notes about the samples. 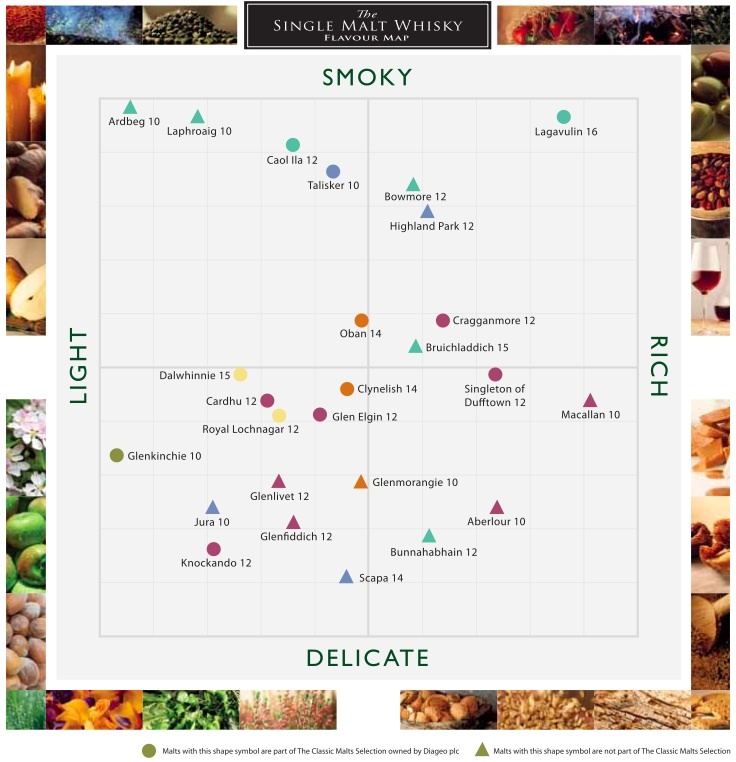 Mr. Ford referred to the Single Malt Whisky Flavor Map throughout the webcast. This flavor map is provided by Diageo, but it does contain distilleries not owned by Diageo. It attempts to place distillery profiles on two scales, from Delicate to Smoky and from Light to Rich. Click on the image to view a larger version. Mr. Ford stressed the importance of using a nosing glass when assessing whiskies, and not something like a tumbler. He also said that blenders typically assess whiskies at half strength (around 20%). Question from audience: Why half strength? Answer by A.F. : The flavors come out from the liquid, into the empty space in the nosing glass, presenting themselves more clearly. It also allows you to focus on the flavors and not be influenced as much by the alcohol itself. Grain whisky, which uses grains other than barley, came to the whisky blending industry in 1832 when the Coffey still was invented. The Coffey still produces a very light spirit, and even after 12 years in a cask, the flavor is still quite light. Mr. Ford stated that it probably wouldn’t even show up on the Flavor Map. He likened Grain whisky in a blend to pasta or rice in a food dish, serving up the flavors of the single malt, and providing drinkability and sweetness. My Take: I thought the grain sample tasted ok, but it’s definitely not exciting, and there is an aftertaste that I’ve noticed in blends that I’m not thrilled about. Actually, though, I wonder about potentially selling inexpensive grain whisky to compete with vodka for making mixed drinks. Why not? He did also mention that the pot stills used in the production of single malts are very inefficient, and not a good way to make alcohol for mass consumption. The pot stills are about making flavor, not alchohol. Another thing Mr. Ford brought up when talking about scotch is smoke. According to him, smoke is the signature of scotch whisky. That’s what tells you that a whisky is from Scotland. He also said this is a key component of Johnnie Walker blends. The smokiness comes from drying barley with peat smoke, sticking with the spirit through the distillation process, through the aging, and arriving in the final product. Today, there are many ways to heat barley, so the use of peat smoke is more of a calculated flavoring process today than it was before more modern methods of heating were available. The lowland malt is still light, but more flavorful than the grain whisky. You’ll find grassy flavors in a lowland malt, along with sweetness and some vanilla. 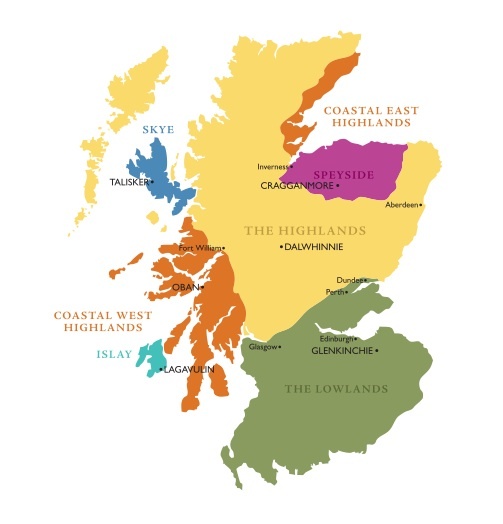 Lowland whiskies will show up on the lighter, more delicate part of the flavor map. While tasting the lowland sample, Mr. Ford talked a little bit about the casks used in aging. Scotch is always aged in previously used casks…typically ex-bourbon, port or sherry. The reason for doing this is that they don’t want scotch whisky to be quite as sweet and woody as a bourbon. By using an ex-bourbon cask, like this lowland sample comes from, you still get the toffee sweetness and vanilla flavors that the American oak imparts, but it’s not quite as intense as you’ll find with bourbon. Question from the audience: Is this sample Glenkinchie? Answer by A.F. : That’s a good guess, but I’m not telling. According to Mr. Ford, Speyside malts are traditionally fruity (fresh fruits like apples, pears and maybe bannanas), along with some grassy notes. You might pick up a tiny hint of smoke in some Speysides, but you’d need a very sensitive palate to pick it up. Question from audience: Is Cardhu a large part of Johnnie Walker blends? Answer by A.F. : There are a number of Speysides in the blend, but Cardhu will always be there as well. My take: I’ve never tried Cardhu, but does it taste a lot like Cragganmore? Because that’s what this sample reminds me of…at least on the nose. The palate seemed a bit more mellow. Mr. Ford stated that he went to great lengths to get the sherry cask sample (from Speyside) included in our blending kits. The flavor is pretty robust, and very different on the palate from the previous samples. Very mouth coating, full bodied and rich. It also has a longer finish. It belongs close to the right-hand side of the flavor map. Not a lot of smoke, but lots of rich fruit flavors like dried raisins and figs. Another note about casks during this segment, was that the “sherry” flavors are not coming directly from sherry left over in the casks, but rather from the European oak used to make the casks. This is where sherry gets some of the same flavors. Question from audience: How does the size and type of the cask influence the flavor? Answer by A.F. : Bourbon casks tend to be about 200 liters and are charred and toasted. The charring removes pungent flavors from new make spirit, and the toasting adds flavors like vanilla and coconut, and also adds color. The smaller the cask, the more wood influence, and the shorter maturation time needed to get that influence into the spirit. The sherry casks tend to be bigger, around 500 liters. Sherry casks tend to only be lightly toasted, and not charred. Question from the audience: Does it matter if your mouth is opened or closed during nosing? Anser by A.F. : Whatever suits you. The J.W. blenders seem to close their mouths. My take: I enjoyed the sherry cask sample. It reminds me of Glenfarclas 10 on the nose, and Glendronach 12 on the palate. It’s not as rich and fruity as the Glendronach on the nose, but it does have some of the spiciness of the Glendronach on the palate that I don’t get with the Glenfarclas. Our sample is a west coast Highland malt, and offers a more robust flavor than the Lowland and Speyside malts. This is where you start to get more of a smoke influence. People also talk of maritime flavors in coastal highland malts. How maritime flavors get into the whisky they don’t know. In fact, malts distilled in coastal distilleries are not always matured there by the ocean. They’re sometimes shipped to inland warehouses for aging. Question from the audience: How long does it take to produce peat, and are we in danger of running out? Answer by A.F. : It takes hundreds to thousands of years to product peat, and there is plenty of it. The scotch whisky industry doesn’t use a high proportion of peat. People actually use it more for gardening. There is no danger of running out any time soon. Island malts are malts distilled on the islands off of the west coast of Scotland. Smoke now becomes much more evident. You will also find spicy and maritime flavors, and pepperiness. On the flavor map, it’s in the smoky region. Perhaps somewhere in the middle on the richness scale. Mr. Ford really seemed to enjoy this sample. My take: This sample is Talisker, I’m sure of it. Mr. Fords comment about it being peppery helps to give it away, too. Interestingly, the sample tastes closer to Talisker 18 than Talisker 10, in my opinion. He said they try to stick pretty close to 12 years for the JW Black whiskies, but I wonder if this sample of Talisker is a bit older. This is the final sample from our blending kits. Islay is an Island off of the west coast of Scotland, but it’s treated as a completely separate taste profile region because of the strong peat influence associated with Islay malts. You get lots of smoke, sometimes an antiseptic note. Whiskies from this region tend to be polarizing. Mr. Walker noted that a little Islay goes a long way, and they’re very cautious with it as a component of the JW blends. Question from audience: What can you say about the color of whisky? Answer from A.F. : The color comes from the casks used to mature the whisky. First-fill bourbon casks impart significant color, but as they continue to re-use the casks a second or third time, you’ll see less color. European oak sherry casks also tend to impart a dark color. He also noted, interestingly, that a pretty good portion of the Islay malts used in Johnnie Walker are going to come from refill casks, which allows the distillery profile to shine through. My take: On first nosing out of the sample bottle, I thought there was some Lagavulin-like iodine. However, upon pouring it into a nosing glass and trying it, I’m almost positive this is Caol Ila 12. 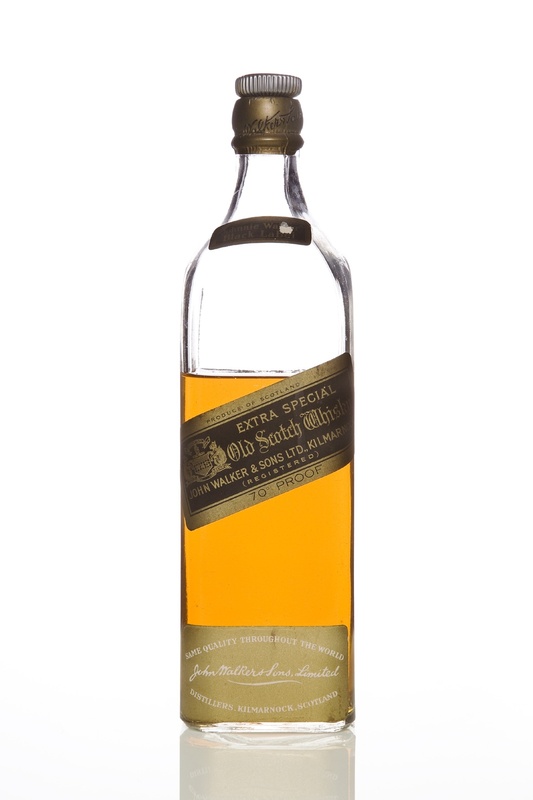 Consulting the Malt Whisky Yearbook 2009, I see that Caol Ila IS a standard component of Johnnie Walker blends. Mr. Ford concluded by taking a taste of Johnnie Walker Black, noting that you’re going to find all of the flavors we’ve been discussing to some level. The whisky samples that we got comprise the big building blocks of Johnnie Walker Black. He then encouraged us to play around with the samples and create our own blends. Some guidance for blending by Mr. Ford: Keep in mind that a little Islay goes a long way…10% Islay whisky in a blend will make it “very” smoky. He recommended using half grain, and a decent portion of sherry cask whisky. However, you have to be careful with sherry cask in much the same way as the Islay malt because of the sherry richness. Question from audience: Do you have a favorite single malt? Answer from A.F. : Talisker tends to be a favorite. A full-on whisky with lots of flavors and just the right amount of smoke [for him]. Question from audience: Are there casks that will be used exclusively in JW Black Label and are not available as single malts. Answer from A.F. : Yes, that will happen. However, almost all of the distilleries offer single malts now, but some of them are hard to come by, perhaps having to go to the distillery for some of them. Question from audience: How did you come to be a Master Blender at Johnnie Walker? Answer from A.F. : Interestingly, he came from the scientific side, and did research on the influence of casks. Over time, they came to realize that they couldn’t turn whisky making into a science, and his time analyzing cask influence eventually led him to blending. That pretty much covers the webcast. I haven’t come up with my own blend yet, but I’ve already typed over 2000 freaking words in this post, so perhaps I’ll do that as a separate exercise. If you want to hear Andrew Ford for yourself, check out the Episode 220 (October 3rd) of WhiskyCast for an interview from the same day as this event. 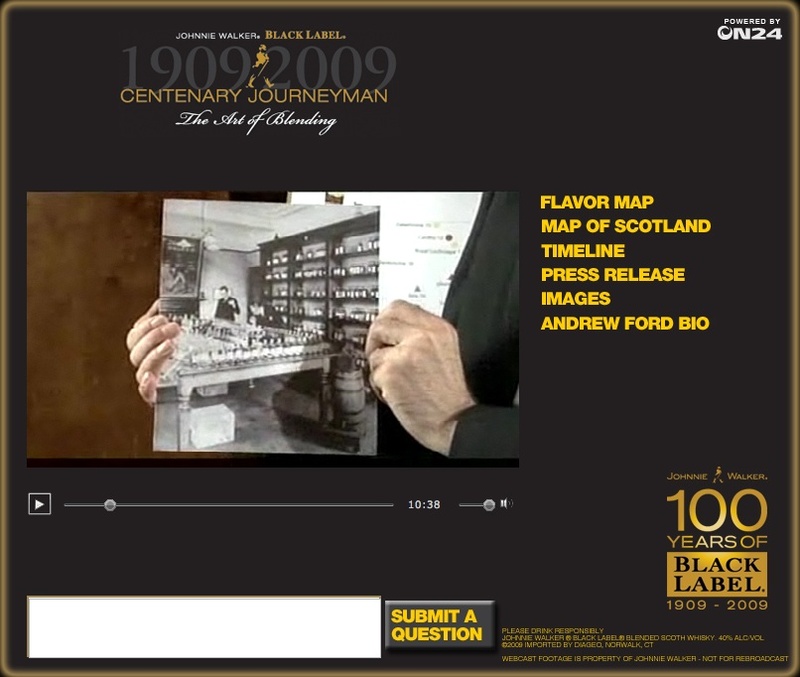 This is my second post about the Johnnie Walker webcast event titled “Johnnie Walker Black Label Centenary Journeyman Blending Webcast with Johnnie Walker Master Blender Andrew Ford.” Whew! My first, introductory post is here. Andrew Ford was the host of the webcast, airing from the Brandy Library in New York City. The webcast was divided into two parts. The first part being a history of Johnnie Walker, and the second being an overview and tasting of 7 whisky samples that represent the big building blocks of Johnnie Walker Black. These samples were sent out in a blending kit to the webcast attendees. In this post, I’ll go ahead and share my notes from Mr. Ford’s history discussion, along with some pictures of the Walkers and some historic bottles for the history buffs out there. Then I’ll do another post with notes from the tasting, along with the Q&A from the interactive webcast. John Walker was thrust into the grocery business in Kilmarnark at the age of 15 when his father passed away. He somehow got into blending whiskies in an attempt to provide a consistent whisky product to his customers. 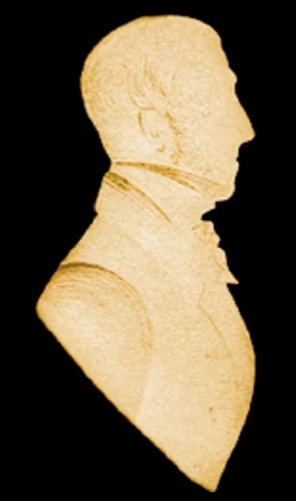 [Note: The initial blends would have been solely comprised of single malt whiskies, as grain whisky didn’t come about until 1832] That’s really about all that’s known of John Walker, and it was his son Alexander that took the family grocery business and turned it into a big whisky company. Alexander built up a wholesale business and started exporting whisky worldwide. He’s the one that came up with the square bottle (possibly for better packing in shipping containers), as well as the slanted label. 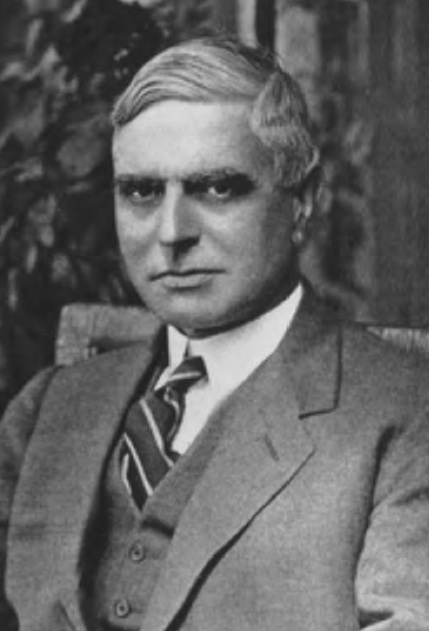 Alexander Walker left the family business to his sons George, Jack and Alexander II. George took over the business operations and became CEO. Jack fell ill and died while looking after the Australian part of the business. Alexander II was the blender. They still have original blending notes from Alexander II in the Johnnie Walker archives. Mr. Ford showed a picture of Alexander II in a blending room sometime around 1910, and commented that the room looked similar to the blending rooms used today. To ensure the supply of whisky for their blends, the Walker brothers started buying distilleries. Cardhu was the first distillery purchased, and is still a cornerstone of the Johnnie Walker blends. Note: Mr. Ford noted during the webcast that this was one of the “happier” pictures he’s seen of Alexander II. Quite the serious fellow, it seems. How did “Black Label” come to be? 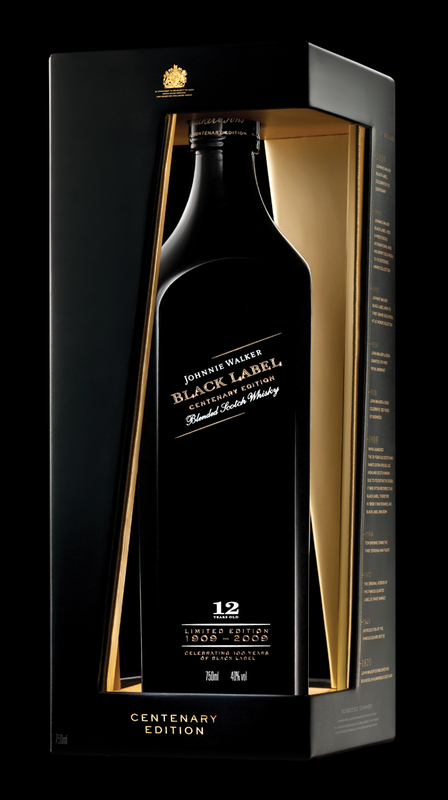 In 1909, they added an extra label to the bottle with the text “Johhnie Walker Black Label”, and here we are 100 years later celebrating the anniversary of the official “Black Label” release. 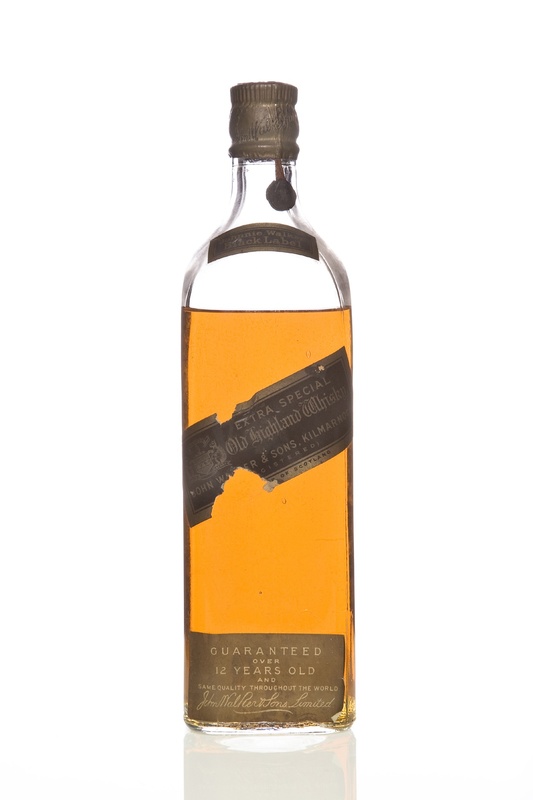 Andrew Ford mentioned during the webcast that he had a chance to try a 1950’s Black Label from the archives. It wasn’t exactly the same as current Black Label, but he noted that some of that could be due to bottle aging. Rather than create one huge post covering the whole webcast, I’m going to stop here and resume in another post, where I’ll cover the process of actually walking through the seven whisky samples provided to the attendees. There were also a number of questions fielded by Andrew Ford during the webcast. I’ll provide the details from the Q&A in the next post as well.